Deep Eddy, is synonymous to “summer time in Austin.” The historic pool, is the oldest swimmin’ hole this side of the south (oldest in Texas). In it’s humble beginnings, Deep Eddy was a natural swimming hole created by a large boulder that formed an eddy in the Colorado River. In 1915, a man named A.J. Eilers, Sr. bought the land surrounding the swimming hole to construct a “Beach Resort” called Deep Eddy Bathing Beach. The highlight of the resort was the concrete pool. Today the beloved pool is host to many athletic swimmers, sunbathers and summer fun seekers alike. 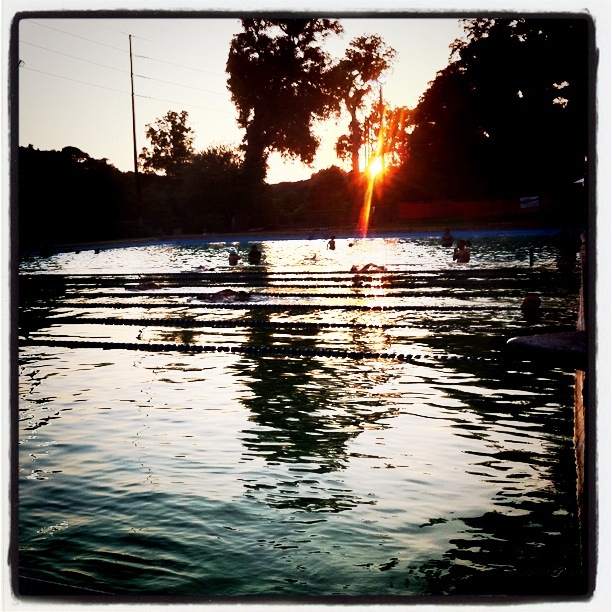 During the summer, Deep Eddy is also host of “Splash Movies.” (Movie AND a swim?!) What better way to cool off after a long, hot, Texas summer day than take a dip and splash around in Deep Eddy while a movie is being screened. Just be sure you pack your sunscreen! Splash movies start at dusk.